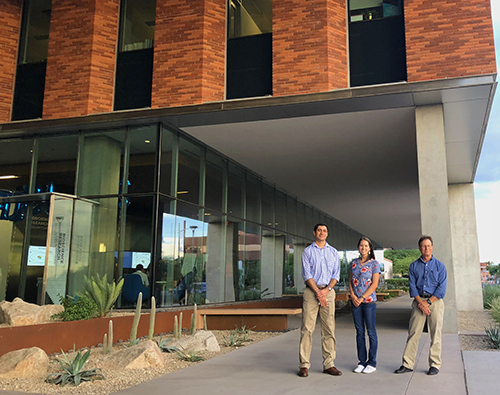 In July, MWG’s designers of the University of Arizona Bioscience Research Laboratory (BSRL) attended a tour of the building presented by the International Institute for Sustainable Laboratories (I2SL). The speaker at the event guided us through the design intent of the HVAC and lighting system, that had a purpose to make the building comfortable, energy efficient, and cost efficient. Their work has paid off as the building has already guaranteed LEED Silver certification and likely will earn Gold. BSRL has stunning exposed concrete shear walls and columns, a 60ft span on the third floor to create a breezeway in the center of the building, and very intricate supports to accommodate the architect’s unique skin system. It was rewarding for all who attended to see the building in use and to hear the praise of the users for its functionality and features.